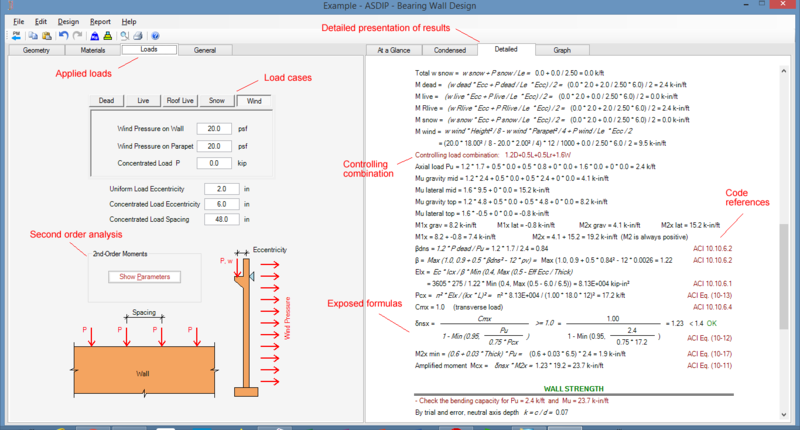 ASDIP CONCRETE is a structural engineering software for design of concrete members. It includes the design of out-of-plane bearing walls based on the latest ACI 318 provisions. The design of out-of-plane loaded walls may become cumbersome and time-consuming, since it involves the analysis of the wall to find the shears and moments, and then the slenderness effects should be accounted for. 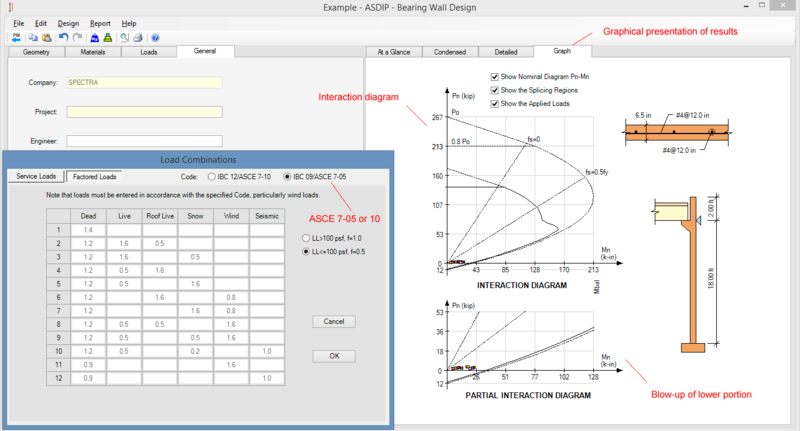 This document is a step-by-step design example of a typical concrete wall exposed to wind using ASDIP CONCRETE. As an example, consider the concrete tilt-up wall shown below, which is part of a warehouse building. The roof consists of a series of joists 4'-0" apart, supported eccentrically 6" on the wall. Consider the wind pressure shown below. Design the wall. 1.- Enter the geometric dimensions of the wall. In this case, the wall height is 18'-0" with a parapet of 2'-0". Let's try a wall thickness of 6.5". Specify rebars #4 @ 12" EW at center of the wall. The At-a-Glance tab shows a summary of the design for a quick overview of your work as you go. 2.- Enter the material properties. For concrete, specify f'c = 4 ksi and for steel specify fy = 60 ksi. The Condensed tab shows a more complete set of results grouped by topic, great for a more detailed overview of your design. 3.- Enter the loads on the wall, which are defined per load case. In this case enter concentrated dead and live loads, and enter wind pressures on the wall and parapet. ASDIP CONCRETE will magnify the moments due to slenderness. The Detailed tab shows a complete set of calculations with exposed formulas and with references to the ACI code. 4.- Select the load combinations as ASCE 7-05. The software generates the interaction diagram of the wall, showing the magnified loads in the same image for comparison purposes. A blow-up shows the lower portion of the diagram for clarity. ASDIP CONCRETE includes the design of concrete bearing walls under out-of-plane loads, such as tilt-up walls, with multiple options to optimize the design easily. 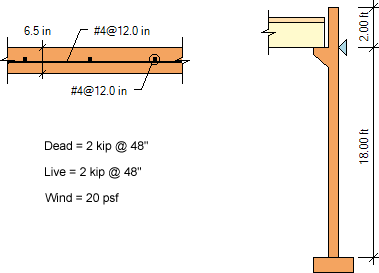 This real-life example shows that the design can be completed and optimized within minutes. 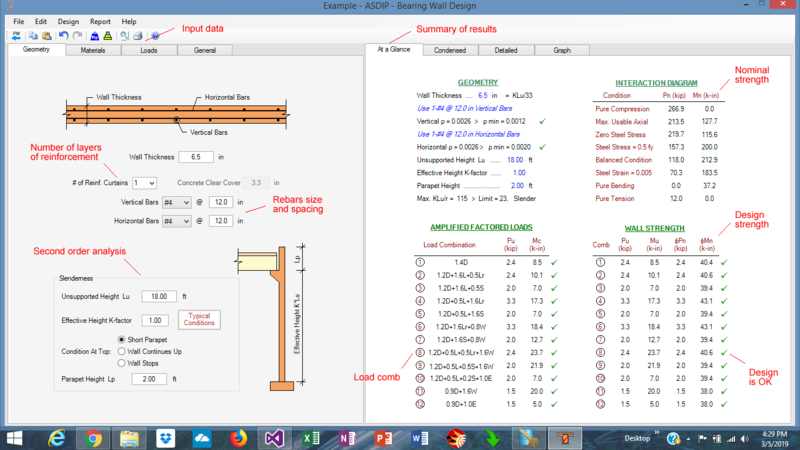 Detailed information is available about this structural engineering software by visiting ASDIP CONCRETE. 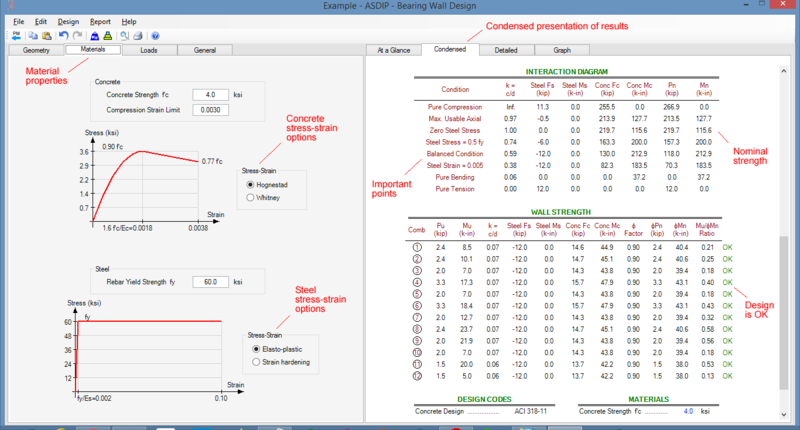 For engineering background, see the blog post Bearing Walls Under Out-of-Plane Loads: A Design Overview. You are invited to download the Free 15-day Software Trial, or go ahead and Place your Order.